I spent today cleaning and sorting and resting my shoulder. It was sunny outside, if blustery. I spent some time at the computer but would wander away to do another load of dishes or to add some addresses I found in this pile to my right to my address book. When I came back to the office, I found this. First of all, the chair has been warmed by me sitting in it. 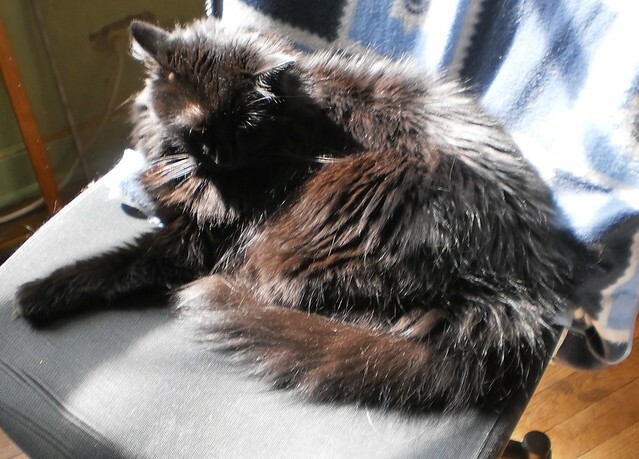 Secondly, the chair stays warm because of the bright spring sunshine. 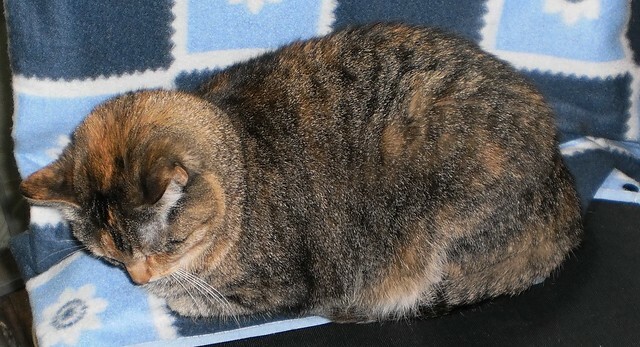 Third, this is her way of reminding me that cats rule my house and I am beholden to their whims. I love how a "black" cat isn't really black, but a mix of brown and black when the sunshine reflects off her fur. Instead of getting the chair all to herself, this tactic means I scoop her up and we cuddle; well, I cuddle. She meows and tries to get away. "Ewwwww," I can hear her say. "She's loving me again. I should pretend to not like this." I did get one set of claws clipped in spite of objections. After doing this for 4 times, she finally decided the best place to lie was in the settee in the living room and left. I'd be willing to bet you she doesn't sit in this chair when I'm not home and she could have all the sunshine in the world to soak up. I scooped her up for cuddles and she meowed to get down. Mija will sit in the chair when I've not used it. I've come home to find her in the chair. If I had the funds to buy each of them a chair and situate it where it would get sunshine you do know where they would prefer to sit. I am flattered that they just want to be near me, but, it's MY chair.